Notice liberals have been using “Happy Holidays” to avoid saying, “Merry Christmas”??? Yep, the war on Christmas is real!!! One thing I’ve noticed when it comes to Christmas this past week is liberals saying “Happy Holidays” instead of “Merry Christmas” when it comes to celebrating Christmas. Conservatives like to use “Merry Christmas” and liberals like to use “Happy Holidays”. Maybe Trump is onto to something about this when he says, “We will start saying ‘Merry Christmas’ again”. Crazy. Why is it that liberals have been avoiding, “Merry Christmas”? Well, I blame it on the fake news media for the most part. The fake news media tells liberals how to think and what to say. I don’t see many people using the famous phrase, “Merry Christmas” at all that much. Mostly Trump supporters and conservatives use it. It’s no secret that liberals are a bunch of “atheists”. They hate religion. They hate anything that has something to do with Santa Claus or Jesus Christ. Just wait until Christmas Sunday comes… I’ll be using “Merry Christmas” all day. I’ll post the meme above to offend libtards in facebook. It might earn me a couple of blocking/deleting from libtards on FB but that’s okay. 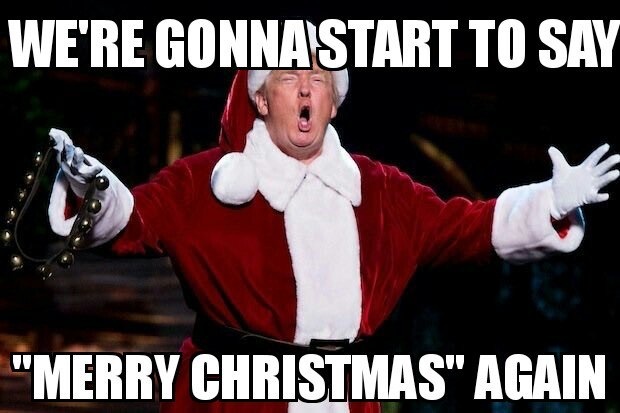 While Christmas this year is exciting, the best Christmas present I could ever ask for that actually happened is Trump becoming our next President. I would think most Americans who voted him feels the same.